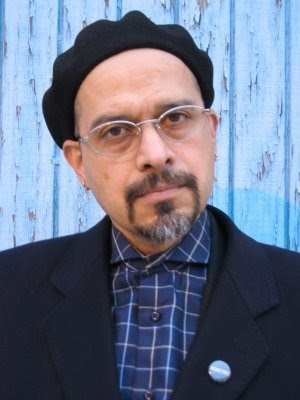 For those who are unfamiliar, Palabra Pura features Chicano and Latino poets reading work in Spanish, English and a combination of the two languages. The series offers Chicago’s large Spanish-speaking population, the third largest in the United States, a venue to read their poetry as originally composed and helps audiences learn more about the strong tradition of poetry in Spanish. A special emphasis is placed on poets who have recently published books or won recognition for their work. Palabra Pura is a collaborative project between the Guild Complex, Letra Latinas of the Institute for Latino Studies at the University of Notre Dame, the Rafael Cintron-Ortiz Latino Cultural Center at the University of Illinois at Chicago, Arena Cultural and contratiempo. This series is partially supported by a grant from the Illinois Humanities Council. Over the last few months, it's been my pleasure to meet Francisco Aragón and find out more about the groundbreaking work he's doing. It's also been my distinct pleasure to meet the Palabra Pura steering committee --Ellen Placey Wadey (Executive Director Guild Complex), Mike Puican and Mary Hawley. But the real reward has been to attend their salon-like welcome dinners for visiting poets, be fortunate enough to read for their audience, and be part of the audience myself. Tell us about Palabra Pura, what it is, how it came together, who are the principals? Palabra Pura originated at the Guild Complex in Chicago. Board member and poet Mike Puican thought there needed to be a poetry reading series that welcomed work by poets who wrote in Spanish and for Latino/a poets in general. It would be a series that included an open mic but, most importantly, a space where Latino/a poets and the Spanish language were welcome. My involvement came about in a very interesting way. Momotombo Press had published a chapbook by Brenda Cárdenas, who has long-time Chicago connections and is a former Guild board member. From the Tongues of Brick and Stone (Momotombo Press, 2005) had found its way into the hands of Mike and his wife, the poet Mary Hawley, who is also on the Palabra Pura steering committee. Initially, they thought about Brenda as a Palabra Pura collaborator, but since Brenda was about to move to Milwaukee, she gave them my name. Mike e-mailed me (This would have been the Fall of 2005). It felt like a gift: a project of this nature was very much consistent with the work I was doing at the Institute for Latino Studies at Notre Dame. Mike and Ellen Wadey, the Executive Director of the Guild, then drove to Notre Dame and we had lunch to discuss the project and my involvement. Because the Institute for Latino Studies has offices in Chicago and we view Chicago as one of the places we do outreach, it was a perfect match. Among the first tasks was coming up with a name for the series and a mission statement. What's the particular niche you hope to fill in Chicago's poetry scene? Do you see the potential for national impact, i.e., Palabra Pura becoming a nexus for Latino/a poets? Can you talk about the visibility/invisibility of Latino/a poets in relation to what the group is trying to accomplish? Although I'm based elsewhere, my sense is that there seems to be a lot going on—from the events the Poetry Foundation puts on to the fairly well-known Danny’s Reading Series (and others). And then there is the Poetry Center housed at the Art Institute and something called Chicago Poetry Project and, of course, events at the various universities, which mostly cater to students. But a cursory glance at these venues, with very few exceptions, suggests that these aren’t spaces where Latino/a poets have a history of appearing, let alone reading work in Spanish. So Palabra Pura serves two functions: it seeks out local Chicago poets who write in Spanish and Chicago Latino/a poets. We also want to look beyond Chicago for emerging Latino/a poets who have recently published a book or won an award in order to give them a place to share their work with a Chicago audience. The series is in its second year and the challenge is to try and reach different constituencies. One of the ways the Guild Complex does this is by forming partnerships. Among our partners are the Latino Cultural Center at UIC, and the community-based publications revista contratiempo and Arena Cultural. More recently, we were very fortunate and pleased to partner with the Poetry Foundation for Victor Hernández Cruz’s reading. By forming these alliances, it increases the possibility of gathering people under one roof who might not normally be in the same space together. And the idea that Latino poetry is what brings them together is quite gratifying. As for a national impact, it’s funny you mention that because I am re-locating to the Washington, D.C. area this summer but will continue to work for Palabra Pura and get to Chicago. The Guild Complex and I are in conversation about starting a Palabra Pura satellite, if you will, in the DC area. This idea occurred to me after learning of, and recently experiencing, a wonderful series in the south Bronx called Acentos, whose mission is like Palabra Pura’s. I do think these gestures can be replicated—though always taking into account the particular circumstances of each community, which is why partnerships are crucial. And the fact remains that there is a need for the simple reason that despite the fact that books are being published by Latino/a poets, there isn’t a plethora of places for them share that work. A series like Palabra Pura attempts to remedy that. Until I had the experience of curating a series like this, I couldn’t properly appreciate how scarce reading slots in a good series are. We do ten readings a year. That means I can invite five men and five women which, when you come to think about it, isn’t a whole lot if I’m tapping the entire country. How would you describe the work and artists featured as they compare with the slam and spoken word scene? Let me speak about the visiting features, which has been my primary responsibility. In Palabra Pura’s first two seasons, I invited people whose work I admired, primarily, on the page. So the first difference might be that while those in the slam and spoken word scene seem to privilege performance, this wasn’t necessarily something I thought about too intently when it came to inviting poets for Palabra Pura. My first contact with a poet is usually with one of their poems on the page. But I do believe that reading a poem well in front of an audience is an acquired skill that takes practice. I am currently thinking about who the visiting poets will be in 2008 and my philosophy continues to be that the work has to work on the page, but I am being more intentional about someone’s performance/reading skills, and I am also aiming for aesthetic diversity. Having attended a few events, its clear to me there is sense of curation involved with the pairing of poets and their material. How does your own background, and that of the other organizers feed that? Before Palabra Pura, I didn’t have much experience with curating per se. But from an editorial perspective, I’ve been working in the field of Latino poetry pretty intensely for the last few years—above all with Momotombo Press and The Wind Shifts: New Latino Poetry (University of Arizona Press, 2007) and, soon, with Latino Poetry Review. Mike Puican and Mary Hawley (who reads and speaks Spanish), the other poets on the Palabra Pura steering committee oversee the curation of the Chicago poets who appear. They rely, to a great degree, on our local partners, such as the people at contratiempo. But we are always interested in learning more about who’s out there. Mary and Mike have also published a book and chapbook with Tia Chucha Press, respectively, and have both been very active in the Chicago poetry scene for many years. You also host a dinner gathering with visiting poets prior to their reading. It definitely has the feel of a salon...lively discourse, the ability to share ideas and break bread. This seems like an important element, can you talk about that? Do you think it's related to Latin ideas of art and culture, of hospitality? When we first started mapping out what Palabra Pura would look like, I don’t think—at least I wasn’t—we were fully aware of how important and special these pre-reading dinners would be. What I’ve come to believe is this: the pre-reading dinner affords an opportunity for the visiting poet to meet and interact with the local Chicago poet, other invited writers and people in the arts. I put myself in the category of client here, as well, because these dinners have allowed me to have meaningful interaction, in the last several months, with such poets like Ada Limón, Cynthia Cruz, Jorge Sanchez and Carl Marcum. Although one can’t control these things, our hope is that these dinners create an ambiance where Latino poets can make interesting and meaningful connections with other writers. This is very much a part of our mission. Your comment about the dinner having the feeling of a salon is something I hadn’t particularly thought of. But it makes sense. During the ten years I lived in Madrid, Spain, one of my favorite activities—one I miss immensely—was my Saturday afternoon “tertulia”—an informal gathering with a few friends at a particular Madrid café to talk politics, films, and books. It suddenly occurs to me that my monthly Palabra Pura dinners have come to fill that function. Personally speaking, I might even venture to say that these are as important to me as the readings that follow. I am very happy to hear you use the word “hospitality.” We want our poets to leave Chicago thinking that, if nothing else, they felt very welcome and everything about their time with us was a model for hospitality. And these dinners are crucial for that. If someone were to ask me advice about starting a series or improving one, I would say: feed your poet a meal and curate your guest list at that meal with as much care as you curate your series. You're also personally connected with the release of an anthology, The Wind Shifts. In what ways is it connected to Palabra Pura? Share with our readers some pieces that you feel are emblematic of the book. Let's daydream for a minute. Who's on your wish list to perform at Palabra Pura? What's the future you envision for the series? I’m in conversation with a number of poets about 2008 and I hope to have the visiting poets portion finalized fairly soon. As soon as I do, I’ll post it. But I will say that while we want to emphasize emerging voices, we are hoping to partner with the Poetry Foundation again next year to produce a reading with two established voices. That’s all I can say right now. As for the future of the series, I would like Palabra Pura to become known as a touchstone of sorts—a series where a Latino/a poet aspires to promote his/her first book; but also a series that spawns not exact replicas as far as the nuts and bolts of a reading series are concerned, but yes a replica where Latino/a poets gather not only to connect with an audience, but also with each other. And to put a finer point on this interview, Beltway Poetry Quarterly is also featuring Francisco in its July/August issue. 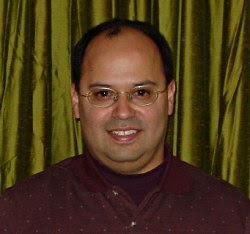 FRANCISCO ARAGÓN, director of Letras Latinas at the University of Notre Dame. And as proof that he must not sleep, Francisco has also helped to create dialogue with the Poetry Foundation of Chicago, now featuring on their site, poets from the anthology, The Wind Shifts. Take a look -- here. Do not miss next Wednesday, July 18, when Palabra Pura features Suzanne Frischkorn and Coya Paz. Time: Doors open at 8:00 PM. Suzanne Frischkorn was born in Hialeah, Florida to a Cuban father and an American mother of Spanish descent. She is the author of four chapbooks, most recently, Spring Tide, selected by Mary Oliver for the Aldrich Poetry Award. Her poems have appeared in numerous journals and anthologies including Indiana Review's Latina & Latino Writers Issue, Margie, 88, Poet Lore, and Conversation Pieces: Poems That Talk to Other Poems, part of the Everyman's Library Pocket Series, (Knopf, 2007). She is the recipient of a 2007 Artist Fellowship from the Connecticut Commission on Culture & Tourism. Her website is www.suzannefrischkorn.net. Coya Paz is a dramaturg, editor, director, performer and is a principal with both Teatro Luna and Proyecto Latina. Teatro Luna is Chicago’s first and only all-Latina theater company. The company approaches their work as artists from the perspective that stories matter, that our stories matter, and that our stories represent histories beyond our individual lives that are not often heard. A few weeks ago, I was able to review Raúl Niño's Book of Mornings, published by MARCHAbrazo Press. Here's some more info as to where you can hear Raúl read from this artfully crafted gem of a chapbook. I would just like to add that among our slated special guests at our pre-PALABRA PURA reading dinner next Wednesday are poet Rich Villar (curator of ACENTOS! ), and poet Tara Betts. Review: The Sun Over Breda. Martín Espada on PBS TONIGHT!